You should know that becoming a buddha is not something new or ancient. How could practice-realization (training and enlightenment) be within any boundary? Do not say that from the beginning not a single thing exists. The causes are complete and the results are fulfilled through time. Great assembly, please tell me, why is it like this? After a pause Dogen said: Opening flowers will unfailingly bear the genuine fruit; green leaves meeting autumn immediately turn red. Let us endevour to be that opening flower and aspire to be the responding leaf. *The Eihei Koroku – Zen Master Dogen. About 4% of the population hear voices. These people literally hear voices in their heads which nobody else can hear. This is not the same as the chatter just about everybody hears in their minds. In the two videos, found at the bottom of the home page, Rufus May talks about an approach that he and others have developed to support voice hearers. There is much that we can learn for ourselves from these talks as well as become better educated, more understanding and compassionate regarding voice hearers. Many bows to you Rufus. Time to turn in and start a new day. The sun will be shining again. 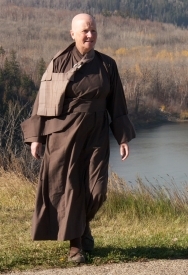 Yesterday I was talking to a monk who I’d trained with as a novice at Shasta Abbey in the early 1980’s. We remembered the intensity of those days, the intensity of the everyday life training. You could say there was a spiritual fire lit under us which was fanned constantly by our engagement with what was before us. That’s hard to explain and easy to misunderstand as some kind of striving, although there was probably some of that too. Years ago I advised somebody to Train as if his hair were on fire! Not that I remember the event, it’s just I have been reminded of having said that relatively recently. Is there ever a time when the fire goes out? Or more correctly the intensity wanes? I’d say yes and no! That is to say the conscious awareness of spiritual fire/practicing intensely comes and goes and sometimes one has to, with all urgency, fan the flames. As a senior monk there is nobody other than oneself to pick up the fan and that’s the same for everybody actually, at any time. However long one has been meditating and however enlightened. One could say that the right use of the will is the koan (problem) of daily living? Anyway, now returning to Dogen Extensive Record (Eihei Koroku) translated by Taigen Dan Leighton & Shohaku Okumura. Just looking at the closed book on my desk causes some anxiety to arises! Even after years and years translating Dogen Shohaku Okumura confesses he doesn’t understand Dogen at all! This gives me some hope. This morning the book opened to Dharma Hall Discourse #60, page 117, This Genjokoan. Rev. Jiyu-Kennet translates the word Genjo-koan as The Problem of Everyday Life. It is just our present rolling up the curtain and letting down the curtain [at the entrance to the meditation hall], and getting up and getting down from the sitting platform. What is this genjokoan? It is just all buddhas in the ten directions and all ancestors, ancient and present, and it is fully manifesting right now. Do you all see it? Today this mountain monk [Dogen], for the sake of all of you expounds this again and repeatedly. Then Dogen pounded the floor with his staff and immediately got down from his seat. Here is part of a letter received from a chap reflecting on his meditation practice. Published here with permission. Today I have been thinking a lot about place and what it means to be away. These times away from home and family are interesting. They give me a space to reflect that I don’t get back home. I have started using them in a kind of semi-retreat way since I have few distractions and social commitments I can build a schedule of sitting twice a day around work – which I can never do when my son is around (not at all his fault of course). This return to a regular sitting practice and quiet time has led to several interesting things; firstly a great sense of gratitude that I still have it inside me to create a practice like this – after a period of several years where my sitting meditation practice at best has been very infrequent I have been wondering if this would be possible. It’s not only possible – it’s a joy and for that I am extremely grateful! What I mean by this is that when we go through a period away from regular practice due to life’s circumstances the lamp light of meditation does not go out; it remains always to be rediscovered again and again at any time. I guess this is not really a surprise but it is like seeing the return of the leaves to the trees in spring – we know they will be there but it’s always a pleasant surprise and joy when they bloom. Now the next thing that comes from this is a finding of contentment. For instance, I had been thinking I would really miss my wife and son – especially missing any day of my sons growing up is always like a small loss. And I do miss them; moments of missing flit in and out of mind, but there is also contentment. Simply being content to be right here, where I am, where I stand. And, paradoxically, at the same time knowing that it is both acceptable and possible to feel that sense of longing within contentment. Does that make sense? Today I was sitting doing some work in the office – I looked out through a sunny window with a view of green trees, freshly leafed, and a background of blue sky and for no special reason felt a sudden sense of serene compassion. How to describe this…a sort of ‘knowing’ that compassion is in the world, that all is exactly as it should be however often it may seem otherwise and wherever we are, that the universe is essentially compassion. It was a fleeting moment, glimpsed then departed – I had a spreadsheet to attend to, work to finish – but the sense still lingers on.